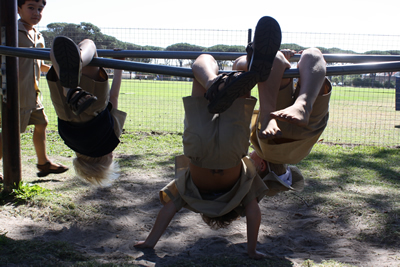 Once a week we offer a Gross Motor programme for the boys during the morning to all boys at the Pre-Prep.These are well planned in consultation with the school and there are various opportunities to improve the child’s awareness of themselves in space, crossing the midline, balance and agility as well as hand/eye co-ordination. The boys thoroughly enjoy the activities where they are all actively involved and which require them to listen and follow instructions carefully. Through these lessons the boys are learning to accept each other’s weaknesses and strengths including their own. In Winter an additional soccer lesson and in Summer a swimming lesson is added to the Grade 1 and 2 weekly programme. In addition to the above, we offer a Physical Literacy programme to all boys in the Pre-Prep. This is facilitated by the teachers for 15 minutes every day. It is a carefully designed opportunity for children to develop the necessary skills for optimal learning in the classroom, through the strengthening of core, general agility, balance and co-ordination along with various other skills. This programme has been designed and training of staff was done by The Sports Science Institute.